The Flying Pig Bookstore is celebrating their 15th Anniversary, and on September 21st, they will be bringing in Newbery award-winning author, Lois Lowry! She’ll be there at 4pm. Join us for this rare visit from Newbery award-winning author, Lois Lowry. Her latest book, Bless this Mouse is a charming novel for kids ages seven and up. This charming and humorous story about church mice is beautifully illustrated by Caldecott winner, Eric Rohmann. We are delighted to have Lois help us celebrate our Anniversary. The Giver remains one of my all time favorite YA novels, and it’s one that I’ve been meaning to pick up for a couple of years now. 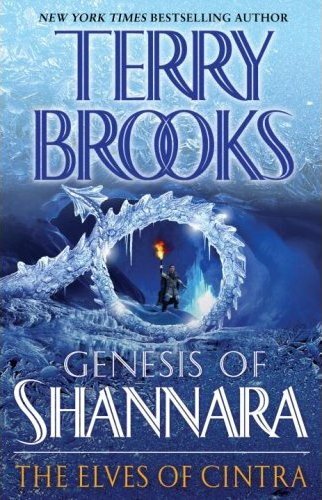 On Sunday, September 11th, renowned fantasy author Terry Brooks will be visiting Vermont. The Flying Pig bookstore is celebrating their 15th anniversary, and will have the author in house for a signing. This is a wonderful opportunity to meet a real legend who doesn’t often come to the East Coast. An RSVP will be required for this event, and it’s advised that you contact the store. You can visit their website here. Ahoy, mateys! Pirate Captain Q and her rascally mate, Crab Claw Chris, will be on deck to teach pirate lingo, do a jolly interactive reading, lead fun crafts, and share treat booty! This past Sunday, members of the 501st Legion’s New England Garrison appeared at the Shelburne Town Gym to take part in a Star Wars Day from the Flying Pig Bookstore, celebrating the release of a new book. 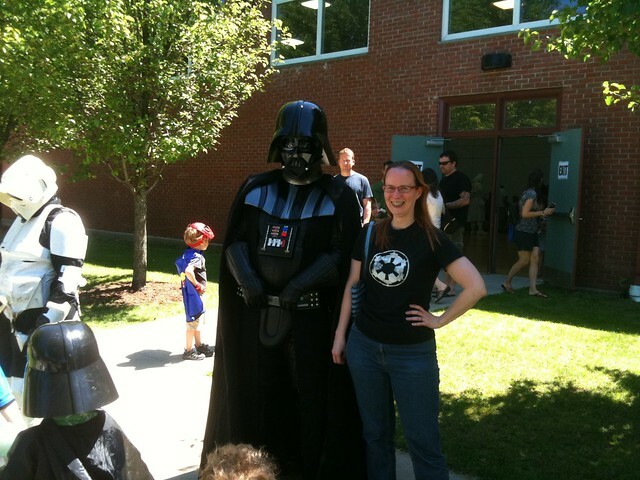 On Sunday, June 19th, members of the New England Garrison headed up to Shelburne, Vermont, for a Star Wars Day, celebrating the release of an upcoming book with the Flying Pig Bookstore. 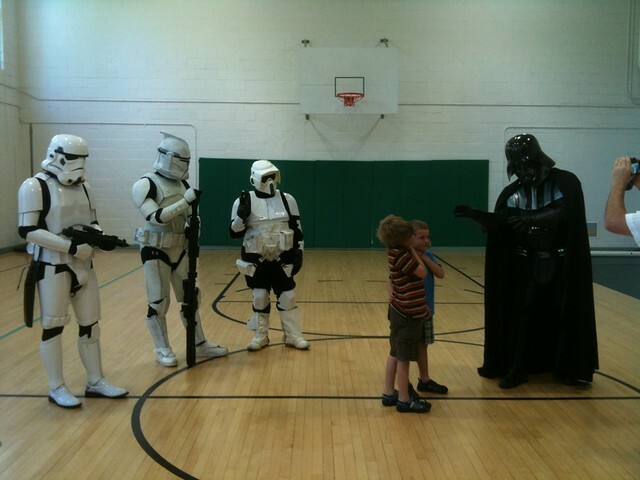 Marked with a prominent STAR WARS EVENT sign, troopers arrived at the event space and suited up, while a crowd gathered in the town gym to wait. As two stormtroopers, a snow trooper and a clone trooper entered the room, the crowd had a collective intake of breath, and quickly lined up to take pictures. The first four troopers were soon joined by Darth Vader, escorted by a Biker Scout, and those who had lined up for pictures quickly rejoined the line for more. The children were often in costume and bravado quickly turned to hiding behind daddy’s leg when full-sized characters came out. Some kids were dressed and ready to meet their heroes without fear. 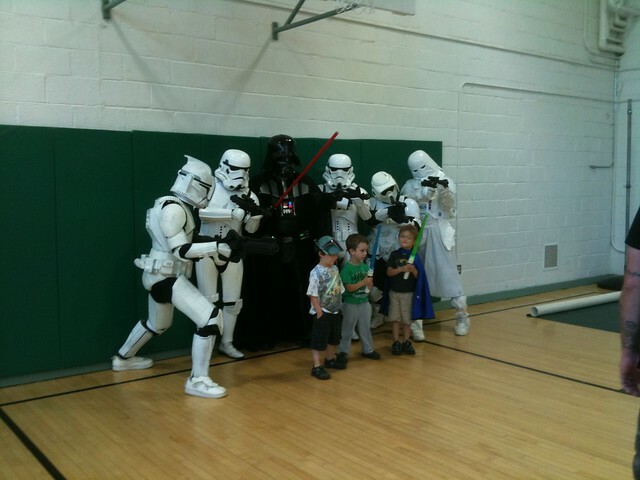 Little Darth Vaders came in several sizes…The 501st [Legion] did a wonderful job and the event was a smashing success. After holding the line for pictures for almost an hour, as the 175 or so participants waited for pictures, the troopers dispersed around the room to meet fans, and took turns going out by the road to wave at traffic. A number of children had dressed as their favorite characters, and the awe from the crowd was palpable. By the end of the day, the event had received around $300 in donations for the Stern Center for Language and Learning in Burlington, VT. The event was a fun one, and we had at least one or two Geek Mountain State followers show up. Many thanks to @DarthLara for the pictures! On Sunday, the 501st New England Garrison trooped over in Shelburne for a Star Wars Event. Photo by @Darthlara.